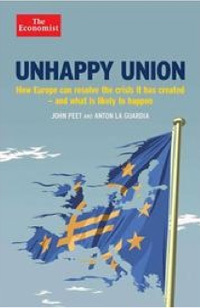 John Peet is Europe editor and a former Brussels correspondent of The Economist. Anton La Guardia is Brussels correspondent of The Economist, for which he writes the Charlemagne column. He previously worked for two decades as a foreign correspondent in the Middle East and Africa, and is the author of Holy Land, Unholy War: Israelis and Palestinians (Penguin, 2006). The euro was supposed to create an unbreakable bond between the nations and people of Europe. But when the debt crisis struck, the flaws of the half-built currency have brought the EU close to breaking point after decades of post-war integration. Deep fault-lines have opened up between European institutions and the nation-states, and often between the rulers and the ruled, raising profound questions about Europe’s democratic deficit. Belief in European institutions and national governments alike is waning, while radicals of both the left and the right are gaining power and influence. Europe’s leaders have so far proved the doomsayers wrong and prevented the currency from breaking up. « If the euro fails, Europe fails, » says Angela Merkel. Yet the euro, and the European project as a whole, is far from safe. If it is to survive and thrive, leaders will finally have to confront difficult decisions. How much national sovereignty are they willing to give up to create a more lasting and credible currency? How much of the debt burden and banking risk will they share? Is Britain prepared to walk away from the EU? And will other countries follow? In their astute analysis of the crisis, the authors describe America’s behind-the-scenes lobbying to salvage the euro, economists’ bitter debates over austerity, the unseen manoeuvres of the European Central Bank and the tortuous negotiations over banking union. In the final chapter, they set out the stark choices confronting Europe’s leaders and citizens.